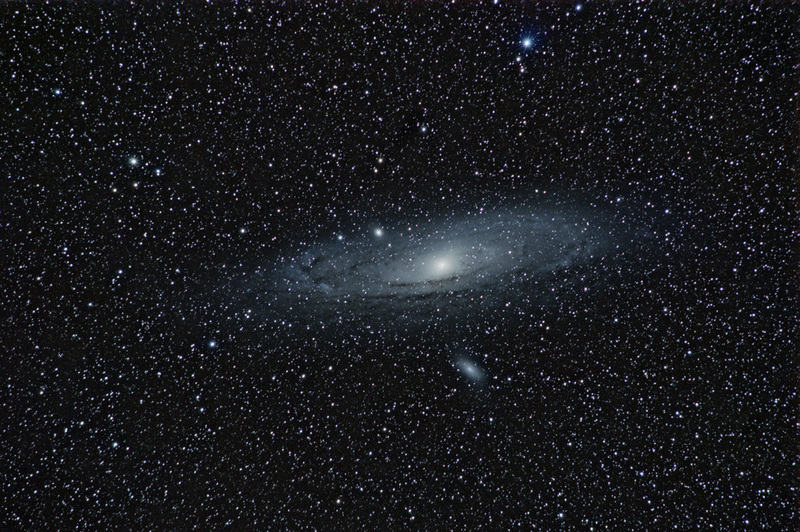 No-one is getting out much for astrophotography in Cumbria at the moment, as we are seeing endless cloudy skies. Plenty of time to practise processing. 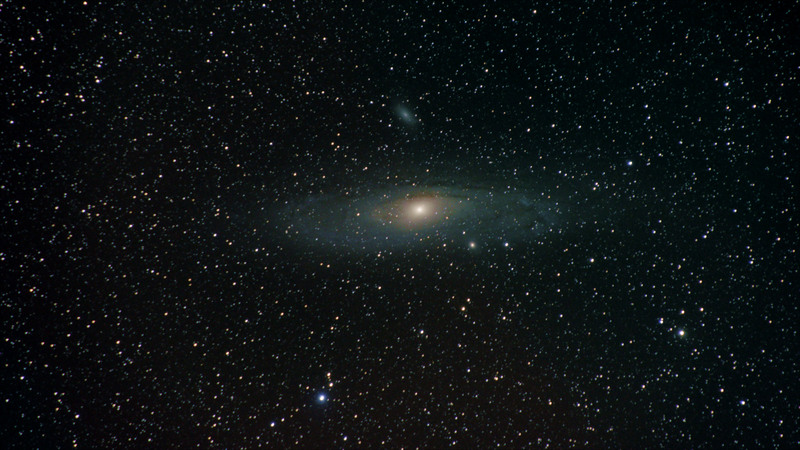 I made it up to my favourite dark lay-by near Tebay on 23 November and captured an hour of the Andromeda Galaxy M31. 29 frames of two minutes each. If you’re wondering what a single two-minute frame looks like, here is one. This is what you get if you open the shutter on your camera for two minutes. The darkness of the background shows what an excellent location it is on the remote country road. I’ve not done any processing on this frame, just converted it to jpeg for display here. 29 frames of 2 minutes. The effect of this adjustment is noticeable at the centre of the galaxy, where previously the detail had been hidden by the excessive brightness. I could be happy with that, but it’s quite hard on the eye, so I layer the original and the transformed versions together in Photoshop, which gives us the best of both worlds. There’s still a long way to go with this. I’d like to take longer exposures without the stars trailing, and so get finer detail in the outer reaches of the galaxy’s arms. Even at two minutes through the 300mm lens, the stars trail by a couple of pixels or so. 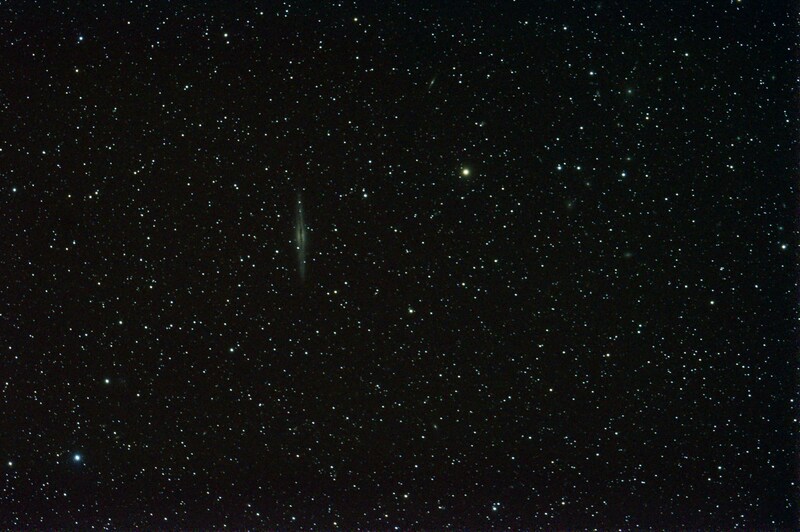 A couple of pixels doesn’t really matter for stars (they just appear slightly elongated rather than perfectly round) but it matters a great deal for the fine detail in the arms of the galaxy. 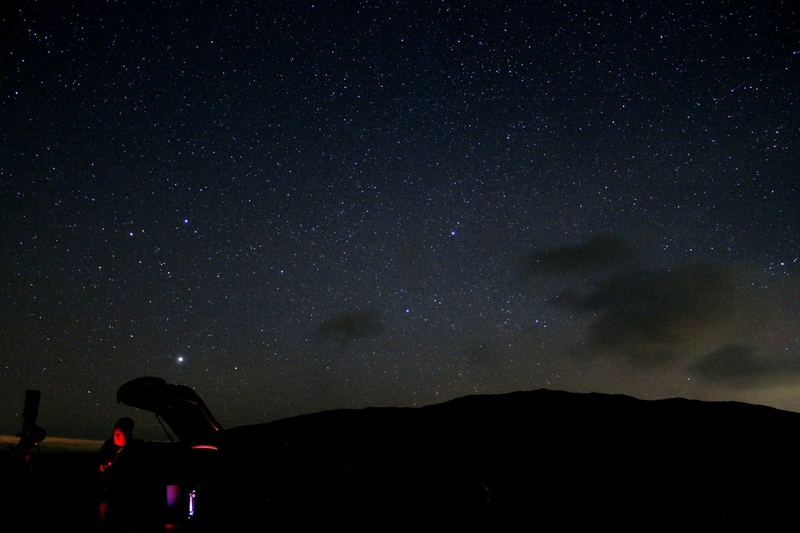 Another clear sky forecast tempted me out to the Tebay road again last night. I have a list of zenith targets that will keep me going for a few sessions. It is important to understand the limitations of your setup in astrophotography. I avoid nebulae, as the red light they emit is mostly filtered out before it reaches my camera sensor: that’s one of the disadvantages of a standard DSLR. Star clusters and galaxies are much more appropriate targets for me – along with comets, of course! Polar alignment went like a dream this time, after the nightmare of the previous outing. The handset reported both azimuth and altitude correct to 1 arc minute, so I felt comfortable taking exposures of 60 seconds plus. With a telescope focal length of 805mm, I still think I should be able to take longer exposures than this without guiding, but further refinement will have to wait – probably when the clocks go back at the end of the month. 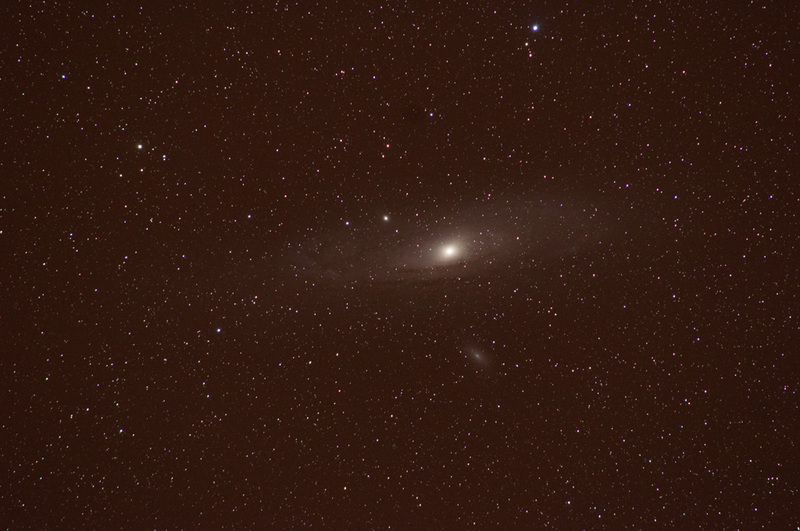 ISO 800, 20 x 57sec. 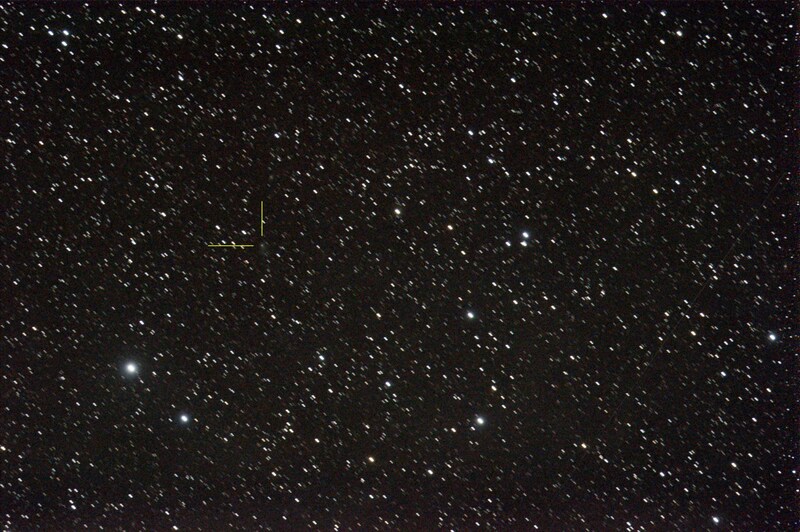 After the Moon sets at about half past eleven, I have a go at Comet C/2011 J2 (LINEAR) which has been reported recently as having split into two parts. At magnitude 14, it is only about 1% of the brightness of the spiral galaxy in the last photo, so it’s about as ambitious as it can be for my setup. I catch the comet (just), but no possible trace of the split. The forecast for the night of the 26th of September looked very promising, so I packed the car and set off for my Tebay Road site about at about 7.30 pm. Full darkness was due at 9pm, so that would give me half an hour to drive and set up, plus a full hour for fine tuning the polar alignment. It still needs practice. Sadly the clouds had other ideas, and after a frustrating couple of hours trying to polar align through cloud gaps – in anticipation of clearing skies later – I decided to cut my losses and pack up shortly after 10pm. Of course, that’s when the skies started to clear, in a tempting, optimistic kind of way, so I unpacked and started again from scratch. From 11pm onwards, there followed about three hours of good conditions, occasionally excellent, in which I took about a hundred and twenty frames of various objects. Afterwards, while the camera sat in the back of the car taking dark frames for calibration, I sat at the telescope eyepiece and manually calibrated the mount’s Periodic Error Correction system. Good to be out under a clear dark sky! 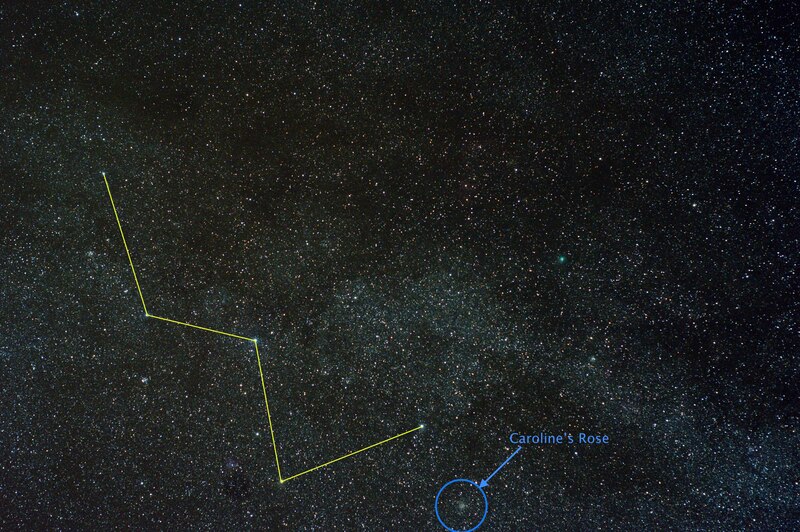 With the comet in the bag, I look to the zenith for promising targets. 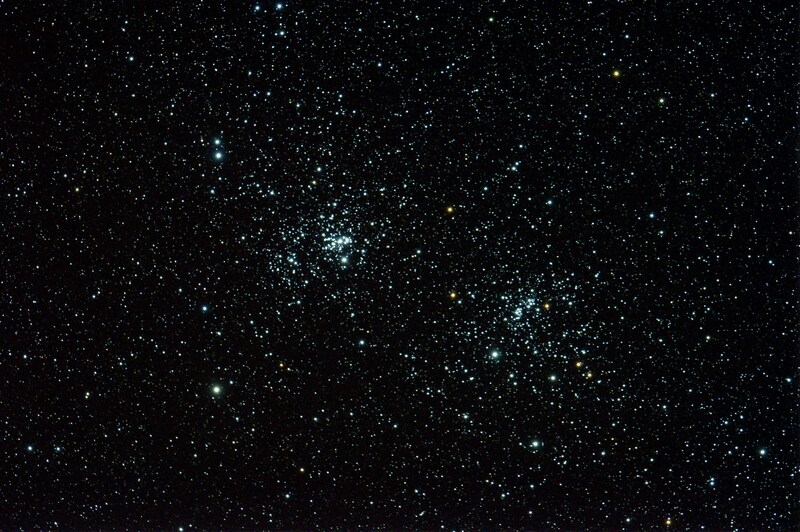 There have been a few to look forward to recently, and I am tempted by NGC 7789, a beautiful looking star cluster in Cassiopeia known as “Caroline’s Rose”. 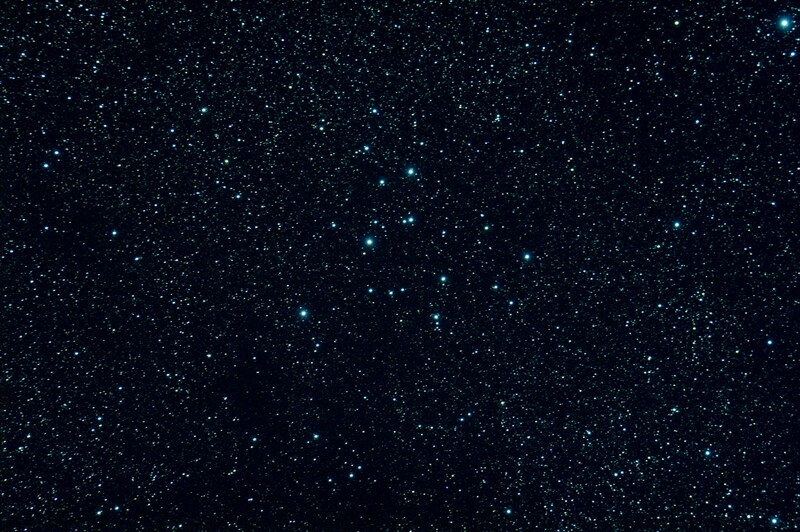 It was discovered by William Herschel’s sister Caroline in 1783, and I have only seen it before in my wide-field photos of Cassiopeia. Nikon D90 on Altair Wave 115/805, 20×45 sec, ISO 3200. 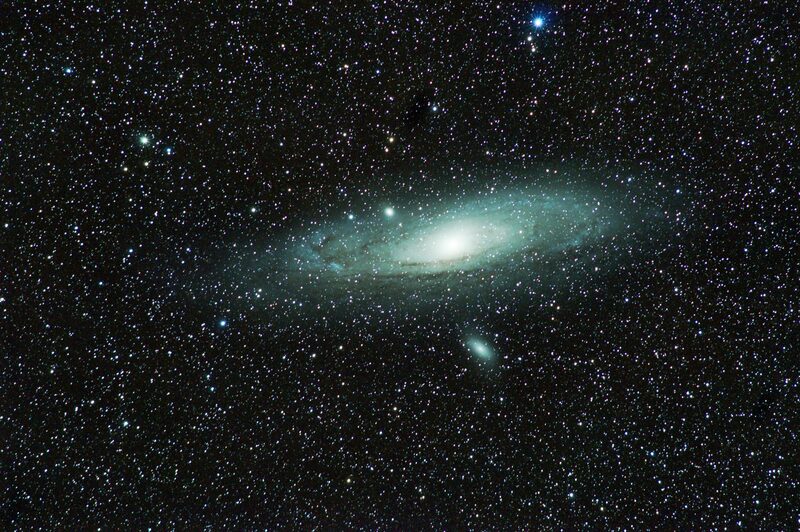 With the telescope in the region of Andromeda, it would be wrong not to take a peek, wouldn’t it? 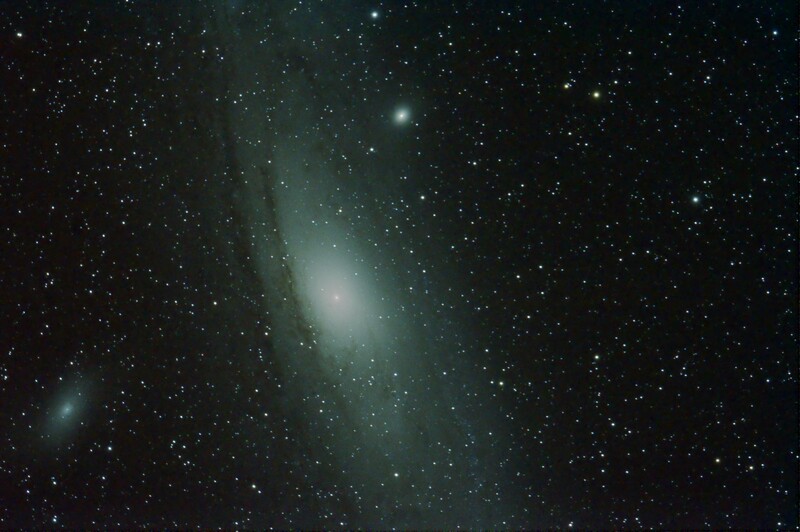 Even with minimal processing, the Andromeda galaxy M31 makes a very big impression through the telescope and deserves a full session to itself on another night. Third clear night in a week! A text message from Stuart Atkinson alerted me to look at the forecast for the night of 26 April, and at half past ten that night we drove out to the Tebay Road under partly cloudy skies. 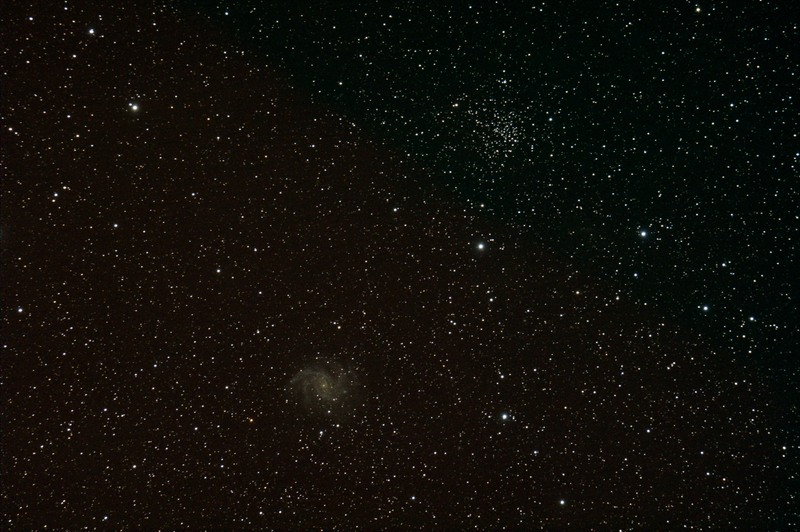 As forecast, they cleared and we managed a good four hours of observing and astrophotography. Stuart has written up the session here, so I’ll stick to my photos. First up, of course, the new standard photo of Comet C/2012 K1 which was almost exactly at zenith (directly overhead) at midnight. Then right next door, also at the zenith, the Pinwheel Galaxy M101. 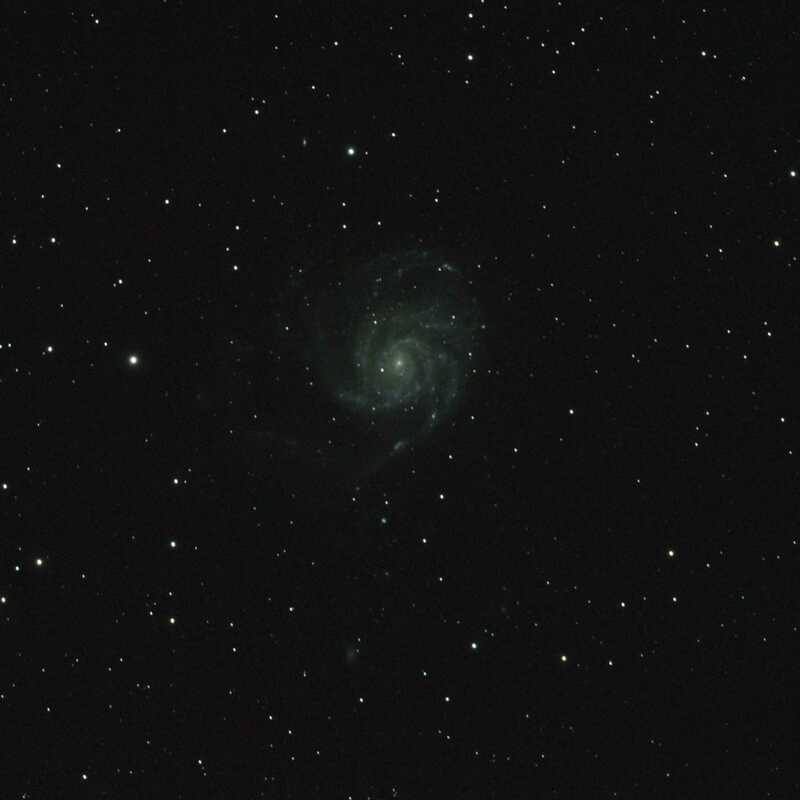 26 April 2014: M101 “The Pinwheel Galaxy” (Mag 7.9) from Tebay Road. Altair Wave 115/805, ISO 1250, 20 minutes. Then I took the camera off, popped in an eyepiece and just had fun looking at stars, star clusters, galaxies, planets, minor planets and all the other stuff that’s in the sky. 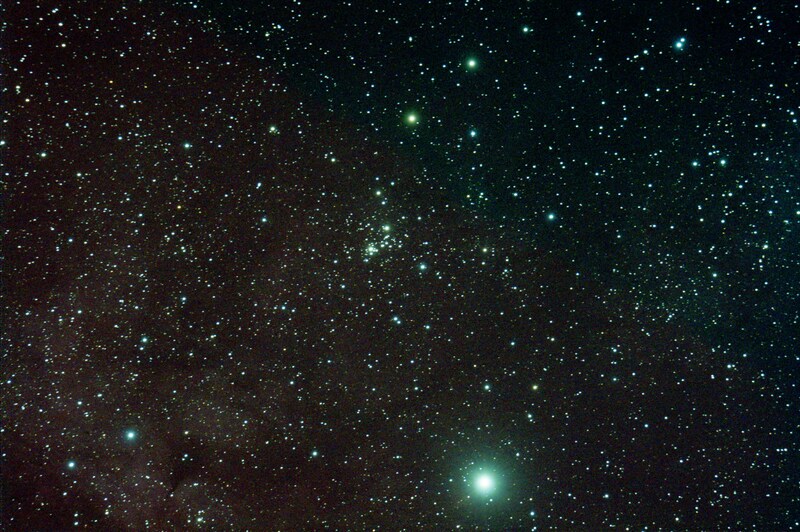 Much of the time we were just gazing without the telescopes. Happy times! Here’s Stuart’s great shot of my scope set up behind the car against a wonderful sky. On 18 April, I drove out to a new location near Tebay to the east of Kendal, in search of higher altitude and darker skies. I had been keen to try this spot for some time, and conditions were just right. With reasonable elevation above sea level, and hills providing shelter from the lights of the only nearby town, it was as good as expected. 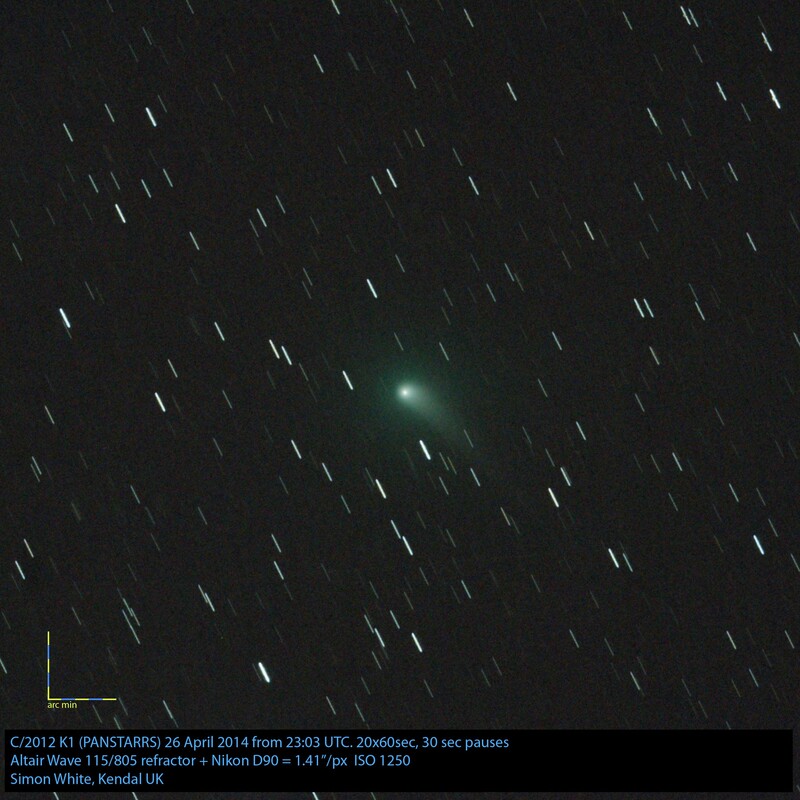 My first objective was the comet C/2012 K1 (PANSTARRS) which has been exciting the astronomy community. 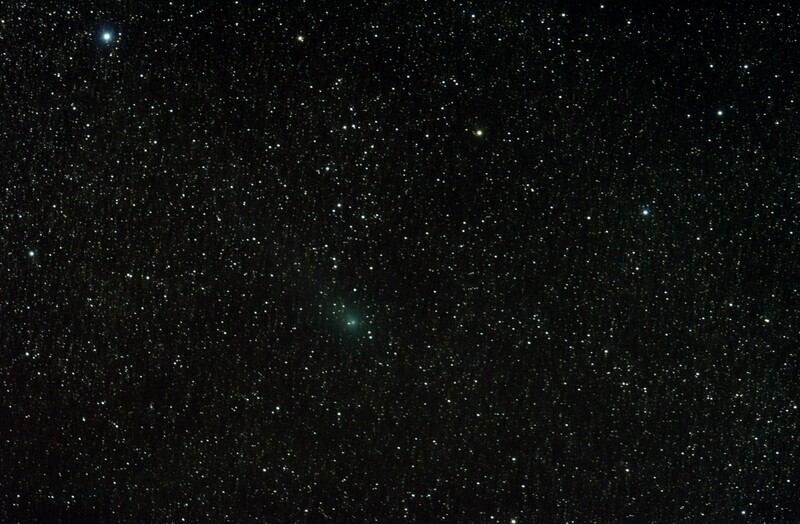 I have been very keen to get the new kit up and running in order to join the amateur and professional astronomers contributing observations, photographs and measurement data for this comet. I could not be more pleased with this, my first serious contribution. You can see that I have added a Photoshop layer of information, showing the angular scale of the capture and various technical details. 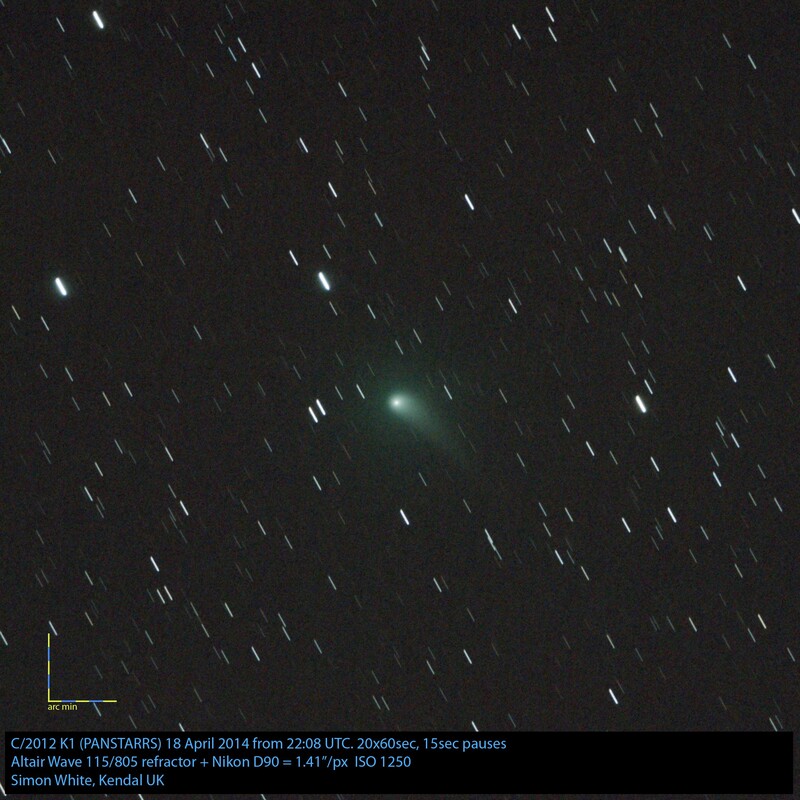 This and others in the same vein will be part of my regular submissions to CIOC, the NASA-sponsored collaboration between professional and amateur astronomers which has evolved from the earlier collaboration prompted by observations of Comet ISON. 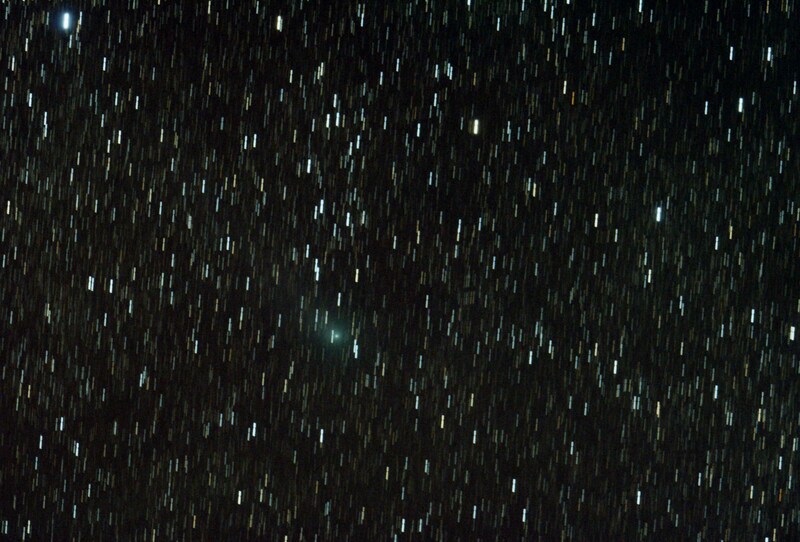 Once the comet is in the bag, I have to catch another target to exercise my processing skills. 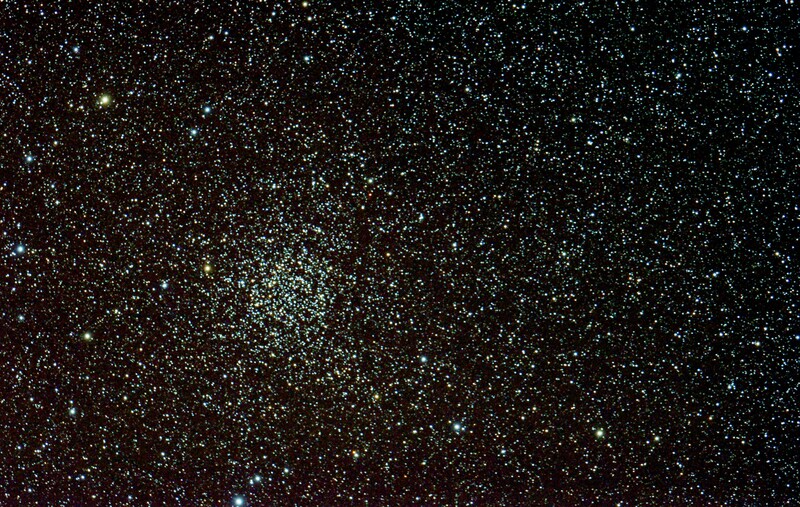 This time I choose a globular cluster in the constellation of Hercules, catalogued as M13. This cluster measures about 145 light years across, is about 25,000 light years away, and contains hundreds of thousands of stars. 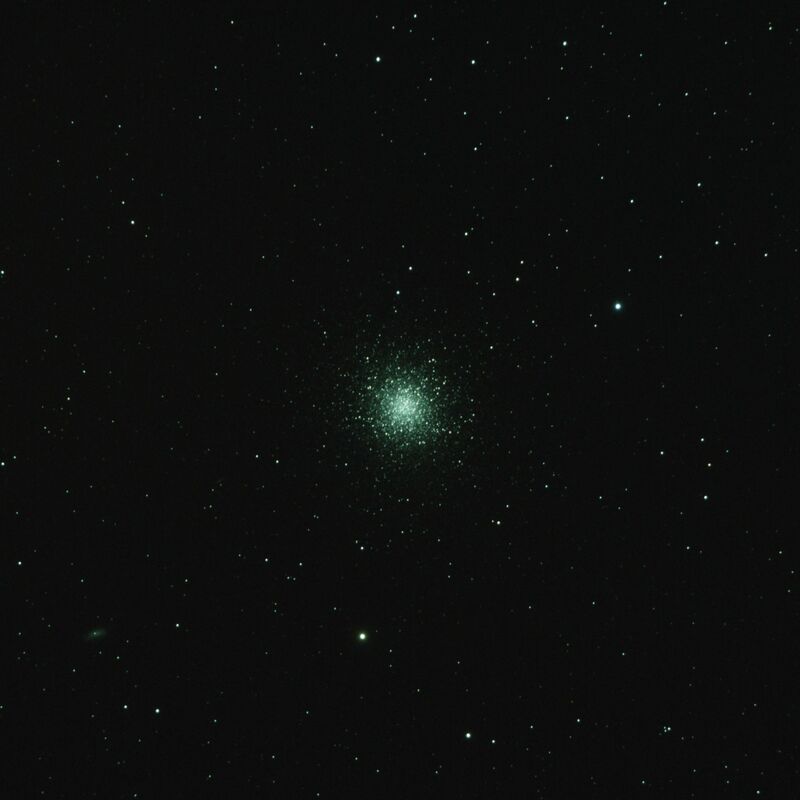 18 April 2014: Globular cluster M13 (Mag 5.8) from Tebay Road. Altair Wave 115/805, ISO 1250, 8 minutes. 16 frames of 30 seconds. I had known there would only be a short gap between the end of dusk (where the Sun is 18º below the horizon) at 22:47 and Moonrise at 00:12 and, sure enough, about half an hour later the Moon hoves into view over the hills in the East and brings the session to a close. The Moon rises and brings activities to a close shortly after midnight. 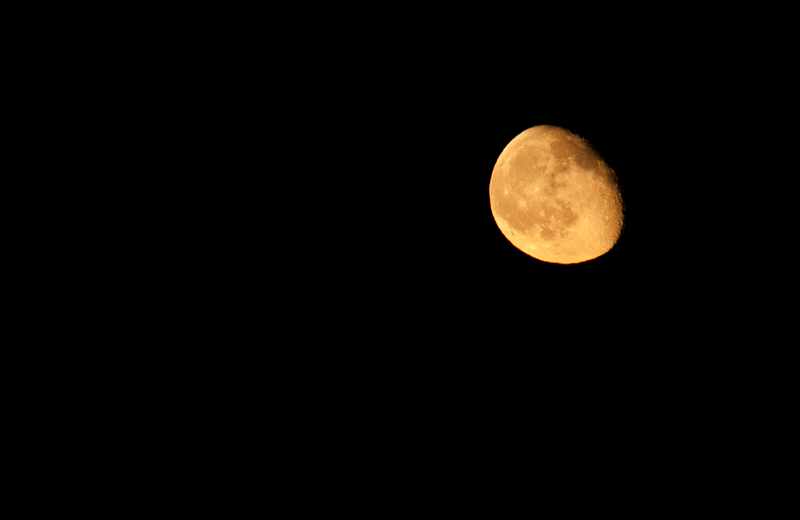 Nikon 300mm f/8, ISO 1250, 1/125 sec.